After setting up our high camp and our climb of Gladstone Peak the previous day we were in no hurry to get rolling and slept in until around 7am. It had been a breezy night with intermittent snow pellets pounding the tent but nothing serious. I poked my head out of the tent and noticed the cloud deck was low enough to obscure the summits of Gladstone and the surrounding peaks. But the temperature was warm and the forecast for cloudy but stable weather seemed to be holding true. For a moment Cynthia and I discussed bailing on the attempt of Wilson Peak but I don't believe either of us was actually serious about that idea. So it was on! I heated up some water for drink and hot cereal (thanks to Cynthia for the nicely compiled granola/raisin/powdered milk cereal), we packed up and left the camp around 8:15am. Our plan was to descend from camp to about 11,400' and make an ascending traverse around the low end of Gladstone's east ridge to gain what appeared on the map to be a nice bench in upper Bilk Basin and then eventually reach the base of Wilson Peak's south face around 12,900' before climbing straight up the face to intersect the west ridge around 13,800'. From there we'd take the west ridge to the summit. The ascending traverse around the lower end of the Gladstone's east ridge worked out nicely despite being a bit steep and hardpacked in places. 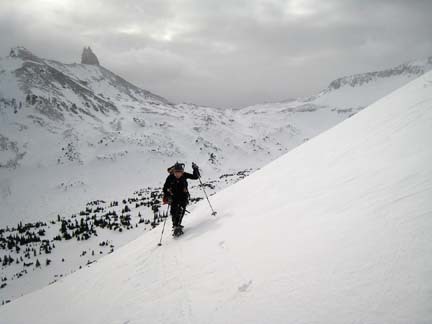 That made it hard for me to skin up on my splitboard and I'm sure wasn't too enjoyable for Cynthia on her snowshoes. But alas it was over quickly and we soon found ourselves on a nice flat bench looking into upper Bilk Basin. Cynthia traversing the lower end of Gladstone's east ridge at about 11,700'. Our high camp is just below the saddle in the background. For a brief while the clouds lifted giving us a super nice view of the surrounding terrain, the upper basin and Wilson Peak. This clear weather would not last however and soon we were hiking in fog and clouds again. Making tracks on the nice bench around 11,900' in Bilk Basin just north of Gladstone's east ridge. We found similar snow conditions in this area as we had encountered the previous day and again were very pleased with the snowpack. As we continued our ascending traverse the slope at one point got so hard and steep that my skins weren't holding and I was forced to carry my splitboard skis for about 100' vertical feet to a more level section. At that point we stopped to enjoy a snack break and take it all in. We commented on how wonderful it was to be in this area in February feeling great about everything. We guessed this area isn't often visited in winter in reveled in our situation--A couple of New Mexicans who just days previous were enjoying sunny, warm days back in our hometowns and now this...wow! We did one more steep, ascending traverse of a slope I wasn't particularly pleased about (due to depth hoar lurking below the six inch crust surface) but it was over quickly and without incident. 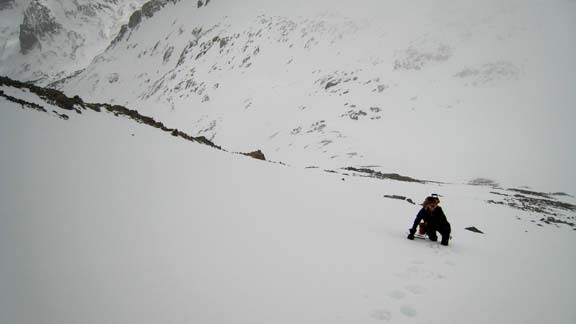 At 12,900' we were looking straight up the south face of Wilson Peak and were very encouraging with what lay ahead. Looking higher into the basin we could see the well-preserved cabin perched at the head of Bilk Basin. 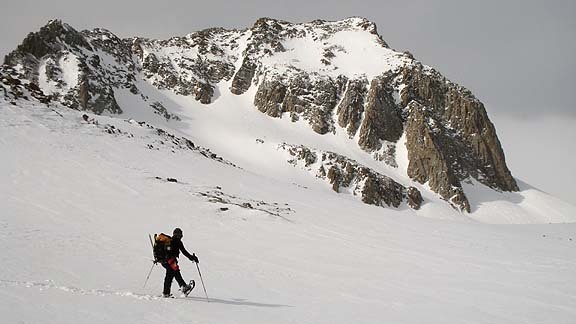 Here we opted to stash the snowboard and snowshoes and bust out the crampons and ice axes for the remainder of the climb. Off we went following a line of great step-kicking snow up the south slope. 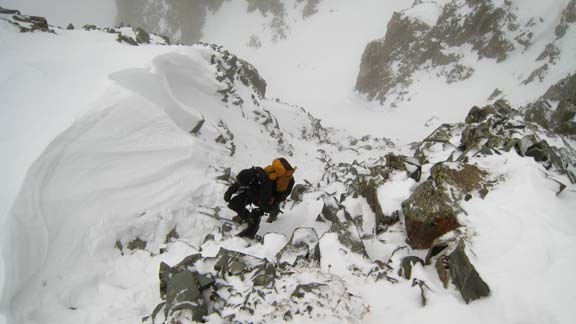 Working on up the south slope of Wilson Peak. At times the snow would get crappy with a crust layer on top and sugar snow to the ground underneath. When we encountered that we'd head for the rock ribs on either side of the snow gully we were ascending for a brief reprieve. It was cloudy with no view at all but warm and quite calm. Things were good. Around 12:30pm we reached the top of the south slope and topped out on the west ridge around 13,800'. I peered over the ridge to the north and found the nice trail of the standard west ridge route. I optimistically hoped we had reached the ridge above always-entertaining "north side traverse" of the standard route but after ascending the ridge for a couple of minutes we found ourselves peering down into the notch that marked the start of this little traverse. D'oh! I've been through this section in spring, fall and now winter, and it's alway an attention-getter! This time was no exception. Cynthia proclaimed we must carry on and so it was. 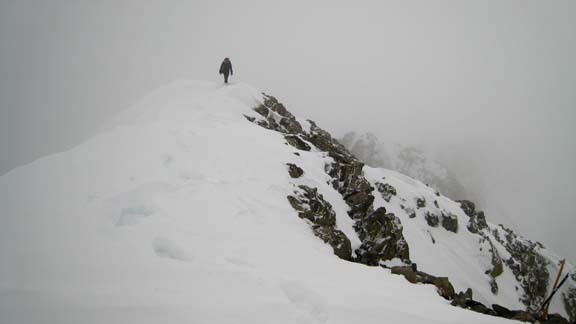 I started down first face-in and kicking steps into the snow and feeling for good rock with the front-points of my crampons. This carried on until we were well into the notch and then traversing east slowly groping for holds on rock and feeling for foot placements. It took us about 40 minutes to go the final 100' vertical to the summit but we were there at 1:30pm and stoked! Cynthia walking the final bit of ridge to the summit. 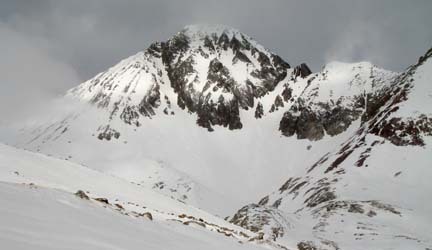 Note the tent-poles cross adorning the summit area in the lower right portion of the photo. I made a half-hearted attempt to dig out the summit area and locate the register but the snow drift on the summit was deeper than I felt like dealing with. We sat down briefly but with no view to speak of and with the idea of returning through the notch looming in the back of my mind I coaxed Cynthia into putting her pack back on after only about 10 minutes on the summit. We headed back down the ridge to the notch. Neither of us was pleased with the rocky section we had ascended out of the notch and opted to descend a steep but nice snow gully to get back into the notch. This went much better and we were soon traversing back in the notch finding our previous steps very useful and secure. 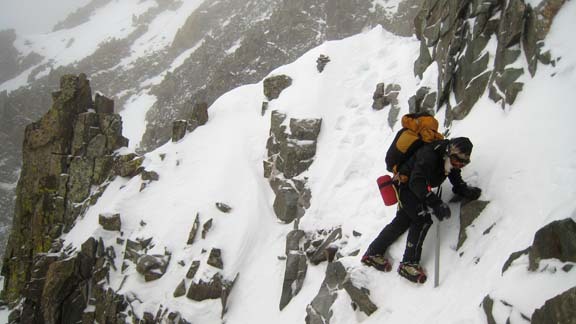 In the notch of the north-side traverse. Check those hand holds and steps! Thankfully we made efficient, safe progress back through the notch and were soon back on easy ground of the west ridge at about 13,800'. Exiting the notch on the return. From the ridge we had a good, fast return down the south slope to our snowshoes and snowboard cache at 12,900'. While I buckled into my snowboard in anticipation of the ~1,500' vertical descent coming up, Cynthia tried her luck with glissading. Ah yes, getting ready for some riding. 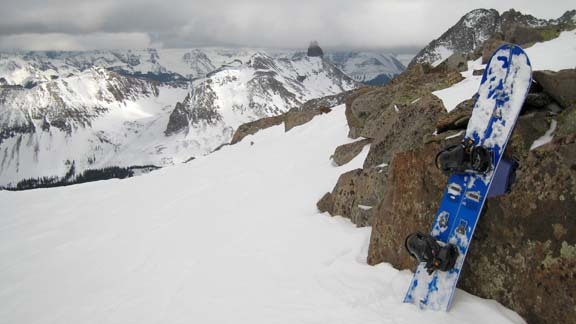 However, she found her pack with snowshoes and other accoutrements attached to be prohibitive to glissading so after a couple of decent runs, she put the snowshoes back on and resorted to hiking. During this time I would make some snowboard turns down for a while but stop where I could keep Cynthia in sight just in case our assessment of the snowpack was exactly accurate. But that never turned out to be an issue and by 3:35pm we found ourselves back down in the lower drainage around 11,400'. Back to splitboard mode I skinned back up to camp at 11,800' about 30 minutes ahead of Cynthia to get the water melting and dinner ready. 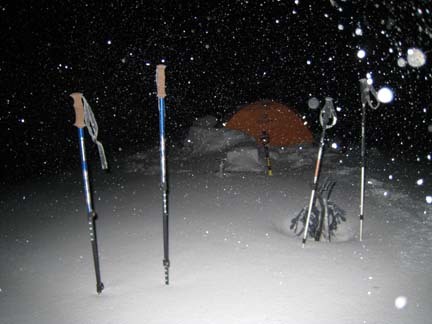 That night we hit the sacks around 8:00pm just as it really began to snow in earnest. It snowed all night and when we got up at 6:00am, there was close to 10 inches of new snow on the ground! Our timing for these climbs had been perfect! Climbing them the two days before this storm was great as now this new snow would likely make the going more unsafe and certainly more work. 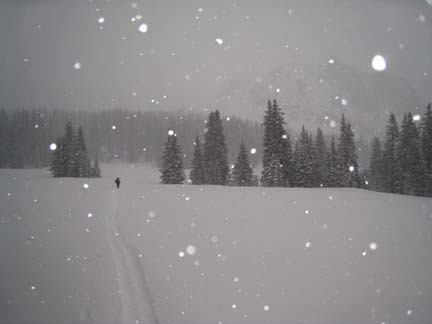 We packed up camp in the blizzard and set out for the car at 7:15am breaking trail in the new snow the whole way. Conveniently, we could still barely discern the skin track we had followed in on Friday and were back at the trailhead by 9:45am. Starting the hike out in the drab, hard to see conditions.